lynette marie: Guess Who's Back? HELLO, FRIENDS! Did you miss me? I missed all of you. 1) I started a new job. I'm a showing specialist for a pretty snazzy real estate office, which basically means I show properties to buyers and spend all day in my car. A few days of the week are potentially 10-hour days for me, so pardon my absence this past couple of weeks! This wimpy little baby was used to 6-hour shifts consisting of brewing coffee and baby-sitting an office phone. I think after my first 10-hour day, I came rip-roaring through our apartment door, twitchy-eyed and with a fistful of my own hair in my hands. Dramatic? Maybe. Accurate? Almost. Kind of. 2) Matt & I have been apartment hunting and are in the process of moving. Packing hasn't started yet but it will soon, because we're moving in like two weeks. Whoops. Do any of you have any extra boxes...? I have to say, though, that this little bloggy break was kind of nice and necessary for me. The last couple of months have been kind of wearing me out because I was letting some stupid form of pressure get to me. I was self conscious of my blog content, self conscious about my outfits, and felt this perpetual need to stay at the tippity top of every single trend and own every trendy item ever. Silly, right? I felt like I was desperately trying to finagle the weird, random items in my closet into "blog-worthy outfits", and God forbid should I wear anything anywhere that wasn't "blog-worthy". I mean, Matt and I were trying to leave to go apartment hunting a week or so ago, and although Matt had mentioned he liked my outfit, I'm pretty sure I was thrashing all of my clothes around our bedroom, tears in my eyes, yelling "IT'S FRUMPY AND NOT BLOG-WORTHY!". Yeah, I needed a break. And in the last two weeks without blogging, I totally felt like I was "out of touch" with the fashion world, but I also made some really smart, necessary fashion purchases. Like, items that I didn't return and have actually worn since purchasing (because I feel like everything I bought in the last few months either got returned or is still hanging in my closet). I felt like I could think about what I needed in my closet, not what I thought my blog needed in my closet. You know? And so I've kind of adopted a little better and healthier of a thought process toward my closet in the last couple of weeks, and I'm hoping it sticks around. Because I don't know how many more useless dresses and disposable jewelry my closet can take! And also, for anyone who gave Lynette one last fighting chance to be a part of your daily blog visitation round, thank you. I apologize for dippin' out for two weeks, but I plan on being back, and back for good! I was a casually planning to email you tonight to see if you were ok, so gad you are! Very exciting about the new job! I'm sure you'll do great! Love the stripes and simple skirt today, so cute! ten hours is so many hours. please take lots of breaks and pack yummy snacks to take with you. also fun playlists for your car, since you'll be there a lot. i feel like i should make you a playlist or burn you a cd and send it to you. would that be super weird? also, i know what you mean SO HARD about A. only wearing blog-worthy things on the blog and B. finally buying necessary pieces that you wear often. except for me, those go together. i bought those boyfriend jeans and the green utility jacket and have worn pretty much nothing else since. i have been so comfortable, but not really blog-worthy (especially now that the jeans are all stretched out....gross). okay, long enough comment // should have just emailed ya. glad you're baaaack. Yay! I was wondering where you had gone! I was on holiday so I've not been following blogs for a while and they all piled up. But no posts from Lynette! I was a bit worried. But glad you are safe and its really good you took a break. Its good to take a break and get back to basics, if I can call it that. If you want to do it again just do it, we will be waiting patiently. PS, Love the shoes! First of all, CONGRATS on the new job:)))! SO awesome! Showing houses is one of my favorite things to do! Writing offers....not so much lol! As for the bloggy break and everything you had included in this post...I want to say I understand, but each person's experiences are unique and I don't want to take that away from you. You never know what it's like until your living in someone's shoes. I'm sorry to hear that you're feeling that pressure (I'm feeling it too), but good for you for taking a break and doing some self reflection:)! Congrats on the new job and the new move! Breaks are totally necessary at times, we all understand. New job and packing?! I don't blame you! Blogging every day or even a few times a week can be exhausting. It is just one more thing on the list to do! Anyway, love your new sandals, so cute! Well, I think we all go through the 'it's not blog-worthy' thing every now and then. I think this outfit is because I love black and white. And I loooove that bag! YAY you are back!!!!! I missed you Lynette. So glad you are back, I would check everyday, and hope you would come back! I love today's look! Wow new job and moving, no wonder you have been under pressure. But I hope whoever is pressuring you about your blog and what it is, disregard, because we love your blog and you! It totally gets exhausting, i feel ya! Anyway, good luck with everything.. looking forward to reading and seeing you daily again!!! Glad to see your back! Congratulations on the new job, good luck on the apartment hunt and...I kinda REALLY want your purse! I'm so, so glad you're back! I've missed you, but I'm glad you feel refreshed after your break! Adjusting to a new job always takes a while, and moving is wicked stressful. I don't envy you right now, my dear! You're back and looking fabulous! You were missed! and I love this one! Simple black and white is my favorite - I love your shirt and skirt together! love this great casual look! Hey I recognize those heels. I also got mine for $15. Not bad eh and they are comfortable. They are my casual ankle strap heels. Love that purse too. Glad you're back. I think a lot of times I see stuff in stores and I'm like, "OMG I NEED THAT BECAUSE EVERYONE ELSE IN BLOG LAND HAS IT AND I NEED TO BE RELEVANT" or "This would be so cute for the blog!" but I have to turn off that thinking and only buy stuff that I actually WANT FOR ME, and not just think will look good on the blog. I took a blog break awhile back and it was really refreshing not having the pressure of having an awesome outfit for the blog and it was a really nice time to rethink my priorities and stuff. 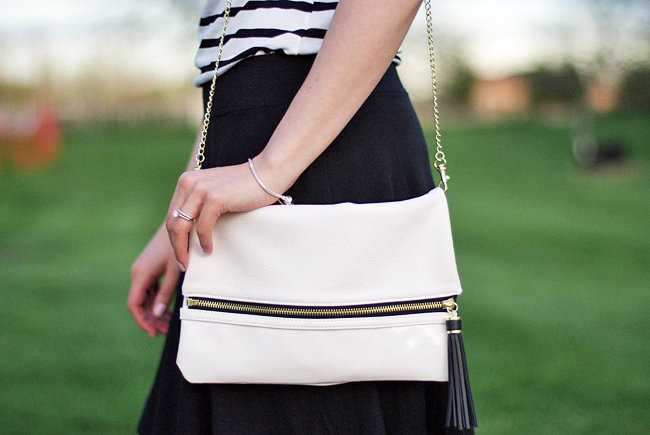 love this classic chic, black & white look. you look fab! So glad you're back! I missed my Lynette dosage each day! I figured you've been busy with your new big girl job though. This outfit is amazing. I saw those heels on clearance at target but I figured that I already have too many pairs of black heels that don't get worn enough. Congrats on your new job!! And I think little blogging breaks can be so helpful. I feel the pressure all the time to own amazing pieces and to showcase every trend, but it's really not possible on my budget and it's not practical either. I think in the end success will come from staying true to our own style and producing content that's really 'us.' But I feel ya! Onto your outfit - love this look! It's super chic (and trendy) without a big price tag, which makes me love it even more! I'm loving the heeled sandal trend, and also that stripes are super 'in' right now but also a classic.